I can see a scenario where either there is a throw-away line that reference Kirk, or the crew meeting Kirk in passing. As far as I am aware, the incident involving the Cloud Creature and the USS Farragut took place at the same time as the first season of DISC, but this season of DISC takes place before Kirk became an academy instructor. So, as of this season, Kirk would be either under the scrutiny of Starfleet, due to the events of involving the Cloud Creature, or on leave recuperating from his experience before becoming an instructor. 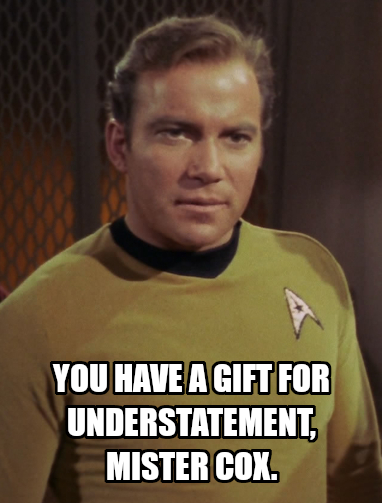 If DSC does an episode about the Farragut disaster, that would probably be the easiest way for Kirk to turn up. There's enough wiggle room regarding the exact date of the cloud creature's attack, that DSC could still feature it and not violate continuity. I don't see why not. One of the things DSC is committed to doing is filling in backstory to the classic TOS characters. And I think it's great. Burning Hearts of Qo'nOs, gblews, JoeP and 2 others like this. I think DSC should stick to the Spock side of things. I feel like it's a situation where they should fight for one but not both. With Burnham as Spock's foster-sister, Sarek a prominent Ambassador, and Pike* commanding Discovery this season, those are all things conductive to having Spock in the series. There's nothing in the series right now that's really conductive to having Kirk. It would just be, "And Kirk shows up!" With Spock, there's context. With Kirk, not so much. It would be like he's suddenly just there. There'd need to be something in the series where it makes sense for Kirk to be there. * Before someone mentions "They also had Pike just show up! ", Burnham goes out of her way to mention Constitution Class Starships in "Lethe" and she's Spock's foster-sister, so it's not out of the question that Spock or the Enterprise would show up at some point, which brings Pike along with it. And with a Starship Captain vacancy on Discovery, all you need is a story reason for Pike to step in, which they came up with. If they can come up with something where it makes sense to see Kirk, then I wouldn't have a problem with that either. I think it just has to make story sense. I think it's a terrible idea. This franchise needs to stop relying on its past. McDuck, Thowra, Hythlodeus and 3 others like this. While I agree it's a terrible idea, I also disagree with your second point. Without the past it isn't Star Trek. They can reference things, just don't make it the focus of the story. The would say reference the Farragut disaster but do not make Kirk the center of the story. Just have him appear on screen for a few seconds or maybe just via intercom, or mentioned in dialog. Burning Hearts of Qo'nOs and Captain Jed R. like this. I'm sure Vic Mignogna would be game since he claimed to have a great relationship with CBS. Since this series is not in TOS universe based on what has been clearly visualized on CBS ALL ACCESS, and Disco is smothering itself with fan wankery on day one; it wouldn't surprise me the creatively bankrupt team spearheaded by Kurtzman to dig up whatever is left of Trek to keep that stinker of a series afloat. Maybe they can even have the Prime Spock (Ethan Peck), Prime Pike (Anson Mount), Prime #1 (Rebecca Romijn), have the third season entirely about Kirk starting his career on Disco and then goes to the Prime Enterprise. I mean CBS has to keep cranking these gimmicks because they don't have much of a show, and they have to get those subscription numbers up. For what it's worth, a young Jim Kirk pops up in the second DISCO novel, which involves that whole unpleasantness with Kodos the Executioner. ScottJ85 and Burning Hearts of Qo'nOs like this. Burning Hearts of Qo'nOs and Greg Cox like this. To be clear, I'd be supportive of a cameo or Very brief 1-2 episode arc. I wouldn't want to see S3 be "Kirk's Season"'like this is kind of "Spock's Season"
Burning Hearts of Qo'nOs, JoeP, Turtletrekker and 1 other person like this. Burning Hearts of Qo'nOs, Captain Jed R., Timewalker and 3 others like this. What does any of that have to do with Vic? He's too old to play anything but a Phase II/TMP/Khan era Kirk at this point. I don’t particularly need to see Kirk as an ensign, unless it has something to do with Kirk meeting Spock. Although I’ve always felt that he didn’t meet Spock until he became captain of the Enterprise. I'm inclined to agree with you. Leaning heavily in that direction. Only except for the fact that Carol Marcus seems to know Spock, or at least met him before. "Why, hello, Mister Spock." I'm not sure when that would've been. Could've been Post-TMP since David remembers Kirk. I wouldn't mind a story where Spock feels like the outsider on the ship, where all of his "comfortable" crew depart, one by one getting replaced by Scotty, McCoy, Kirk, Uhura and Mitchell in the key positions. I'm my minds eye, maybe Sulu and Kelso were the only ones that served on Pike's Enterprise, maybe. I'm not sure when that would've been. It could have been anytime. They were both prominent scientists, and they both worked either in or with Starfleet. They don't have to have crossed paths before only when James Kirk was involved. Are you trying to make some connection between the Vic Mignogna sexual harassment and homophobia allegations and CBS? Seems like an odd thing to mention now, even with his role in ST: Continues, and the general hostility of the rest of the post casts that remark in a negative light. JoeP and Awesome Possum like this. And this is a terrible post. Star Trek has always relied on the past. It always will rely on the past, just like every other major franchise IP. In fact, one could argue that 'relying on the past' is a definitive characteristic of major franchise IPs. Turtletrekker, Phoenix219 and Lord Garth like this. I'm sure Vic Mignogna would be game since he claimed to have a great relationship with CBS. Not sure Vic has the range to play a guy in his twenties. XCV330, Firebird, JoeP and 2 others like this.